Avenged Sevenfold, Volbeat, and Gojira will be there too! Nothing wakes us up on a Monday quite like some heavy metal music and an amazing tour announcement, courtesy of Metallica. The Rock and Roll Hall of Fame inductees will be headlining their first North American tour since 2009 (when they hit the road for the epic World Magnetic Tour which lasted two years). 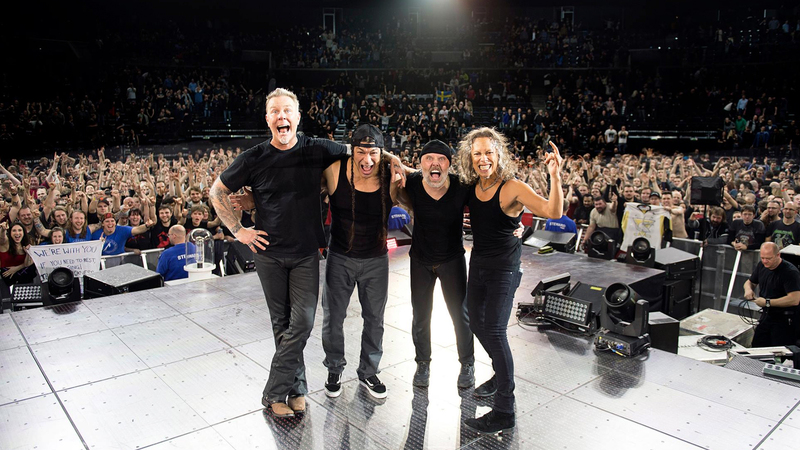 The 2017 dates are in celebration of the LA group's new album Hardwired...To Self-Destruct, their first release since the previous tour's purpose: Death Magnetic. This new batch of head-banging songs was released back in November, and the wait has been well worth it since the metal icons will be hitting major cities like Philly and Chicago, and basically everywhere else this year. They’ll be kicking off in Baltimore, MD at M&T Stadium on May 10 and wrapping up on August 16 in Edmonton, AB, Canada at Commonwealth Stadium. Tickets will be available here beginning this Friday, February 17. The coolest part? Each purchase comes with a copy of the new album, either a physical CD or a digital download—so you can hold yourself over until the band gets to your city. Even better? Avenged Sevenfold, Volbeat, and Gojira will be supporting the Grammy Award winners (and recent performers) throughout the run. .
Be sure to start tracking Metallica with Bandsintown, so you never miss out on another live show!